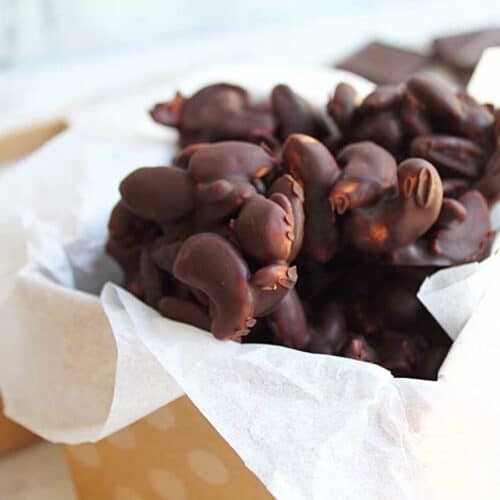 Indulge in homemade chocolate covered nuts in just a little over an hour. Melt chocolate, stir in nuts, drop on cookie sheets & let set. That's it! Prepare a cookie sheet by covering with wax paper. In a microwave safe measuring cup or bowl, break up pieces of chocolate and cook in microwave on high for 30 seconds. Stir and repeat in 30 second intervals until the chocolate is almost melted. It usually takes about 1-1/2 minutes. Stir until completely smooth. Add nuts to chocolate and stir to coat. Drop by heaping teaspoonfuls onto prepared cookie sheet. When all candies are made, place cookie sheet in refrigerator until set, about 1 hour. Once set, you can store them in a resealable plastic bag until your next chocolate craving. Total time does not include the 1 hour they take to set in the refrigerator.